Joey Markville restaurant provides an island of intimate dining amid the bustle of a large shopping centre. 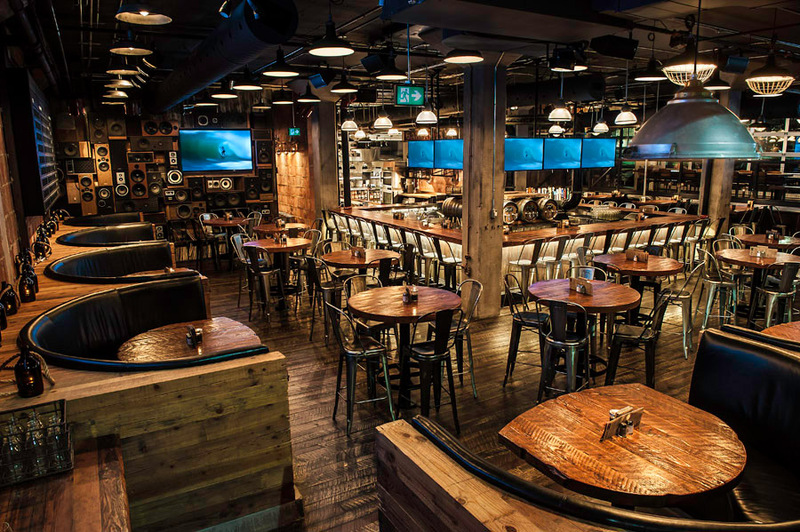 The wood, brick and steel of its modern exterior carries inside to create rich and warm interior of a variety of seating arrangements, a friendly bar and Joey`s signature "open kitchen". The inside space opens to patio seating on one side by means of stacking glass doors, and on the other, through pivoting glass & steel walls that swing out to form canopies over their outside spaces. Creative lighting highlights the richness of the materials while giving an intimacy to the space. — Reg Callaghan, P.Eng., Vice President. 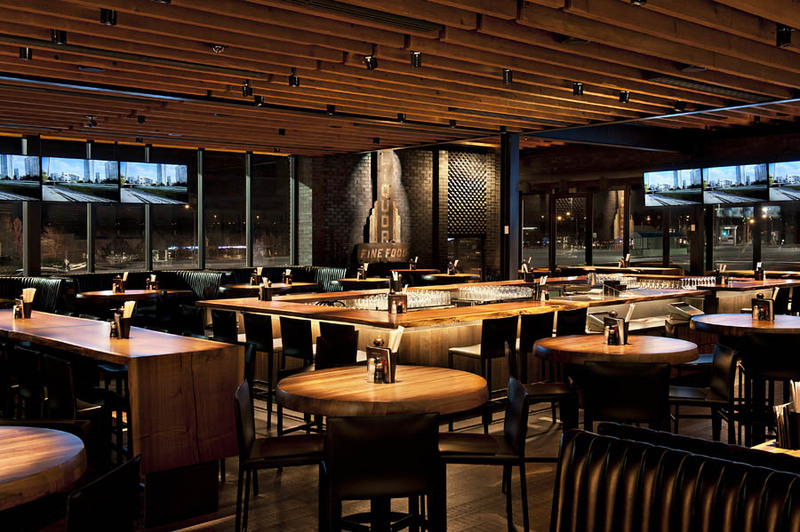 The Mitchell Partnership Inc.
A two storey masonry building with a modern industrial style restaurant interior attached to the Sherway Shopping Centre. The exterior features an iron-wash black brick masonry façade with black steel canopy and custom curved metal panel façade at the revolving door entryway. An open patio at the 2nd floor with steel post and beam gird may be enclosed by a 30 feet x 58 feet awning system. 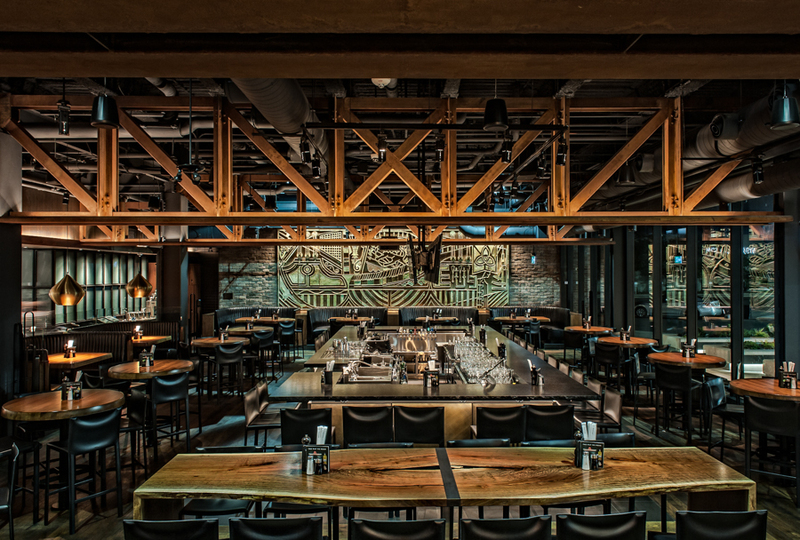 Interior features include three industrial railroad Pratt-style trusses, an open wood and metal clad steel stair and interconnected floor spaces containing two storey high chandeliers. The interior walls are clad in Purlinton brick pavers, vintage signwork and a feature 9 feet x 25 feet copper relief. 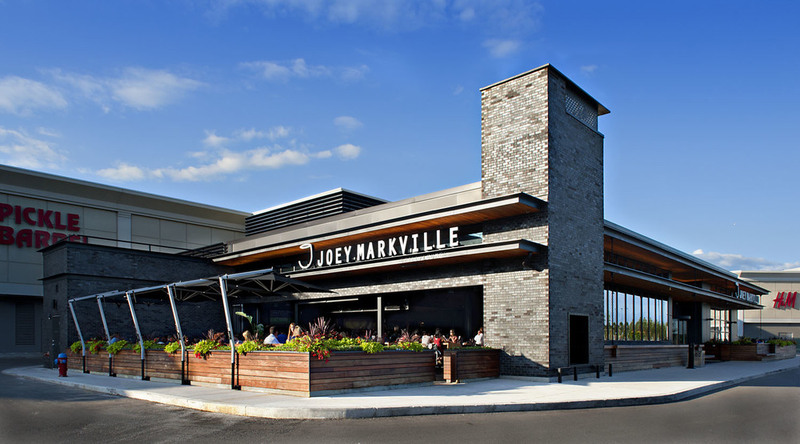 A two storey brick masonry building with a modern industrial-style restaurant attached to the Yorkdale Shopping Centre. The exterior features include a black steel canopy, a full height acid-patinated steel drum surrounding the revolving door entry and six full-height double-hung windows adjacent. The interior contains a fully-glazed elevator and the pulleys and counterweights that operate the windows are expose on the inside and visible to the exterior. The upper floor is accessed by means of an open granite & precast stair cantilevered off a central steel box stringer. The interconnected openings between floors have large custom chandeliers suspended within. 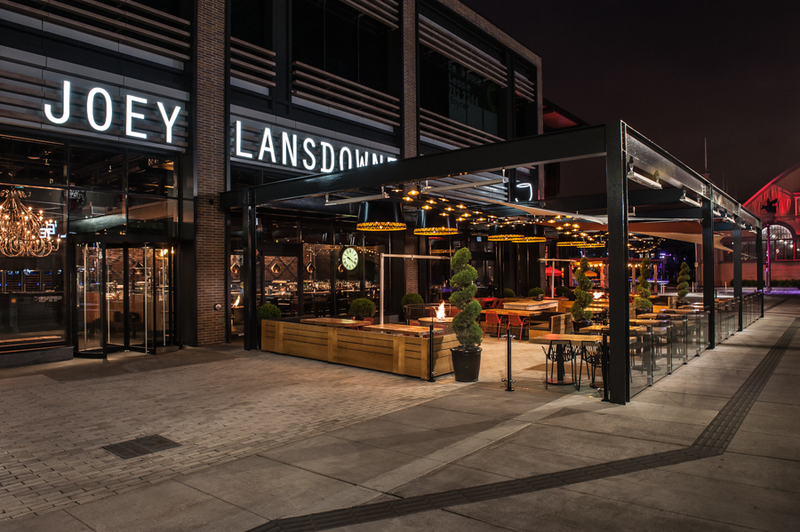 As part of the newly redeveloped Lansdowne Park in Ottawa, Joey Restaurant occupies a large area of the Ground Floor of a new retail/office building on the main boulevard opposite the stadium. 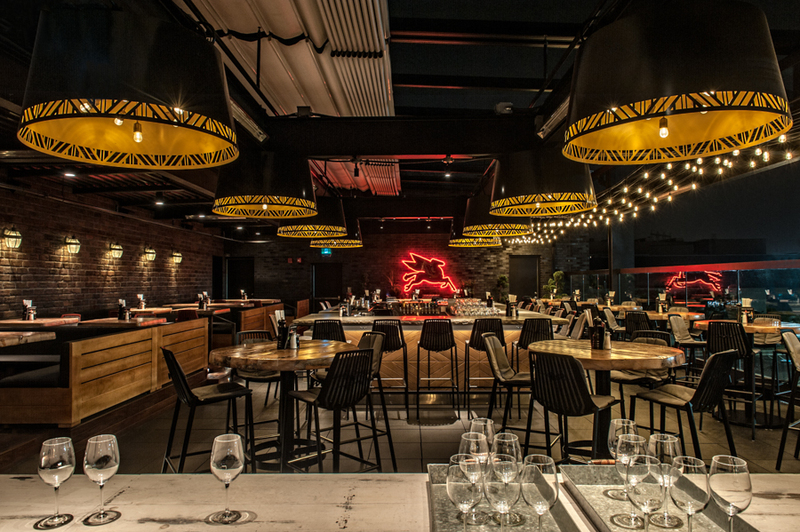 Following their successful formula of a rich pallet of wood, brick & steel for their interiors, it offers bar, booth and table seating beneath a variety of interesting lighting. The open kitchen gives an animated focus to the space. Adjacent to the entrance is a large outdoor seating area defined by a steel column & beam framework, enclosed by wood planters and glass and topped by suspended lights and cloth sails. Located in Toronto’s Liberty Village, Local Public Eatery Liberty occupies space in a former factory building and incorporates much of the industrial character of the neighbourhood. The interior features exposed structure and services and uses reclaimed materials and finishes. 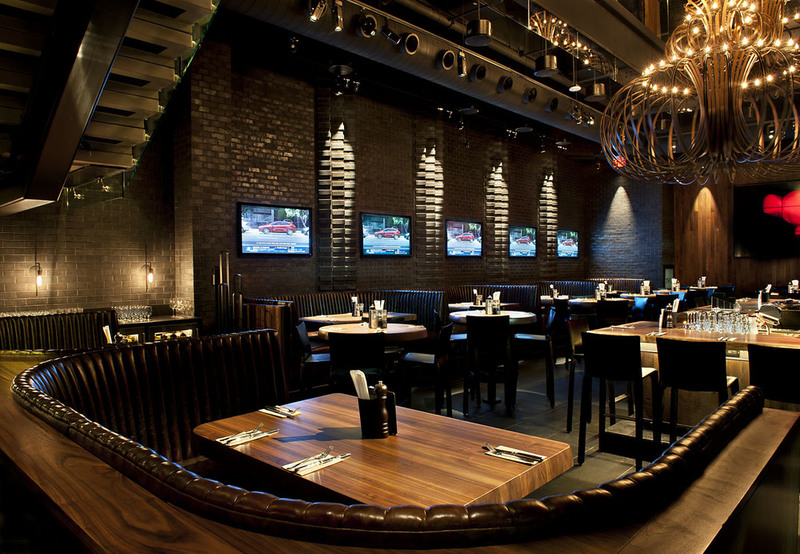 The large open space contains a central bar, table and banquette seating for 120 patrons. Overhead doors along the perimeter open to the street and to an outdoor patio seating another 60 people under a wood trellis that also features a bocce court. Situated opposite from Ottawa’s well-known Aberdeen Pavillion, Local Public Eatery Lansdowne occupies the Ground Floor corner of a new 2 storey retail/office structure. The retro industrial interior is of structural clay tile and metal in various forms with the focus on the open kitchen beneath a suspended triangular plane of reclaimed corrugated roofing. A myriad of suspended light fixtures hang over bar, booth & table seating. 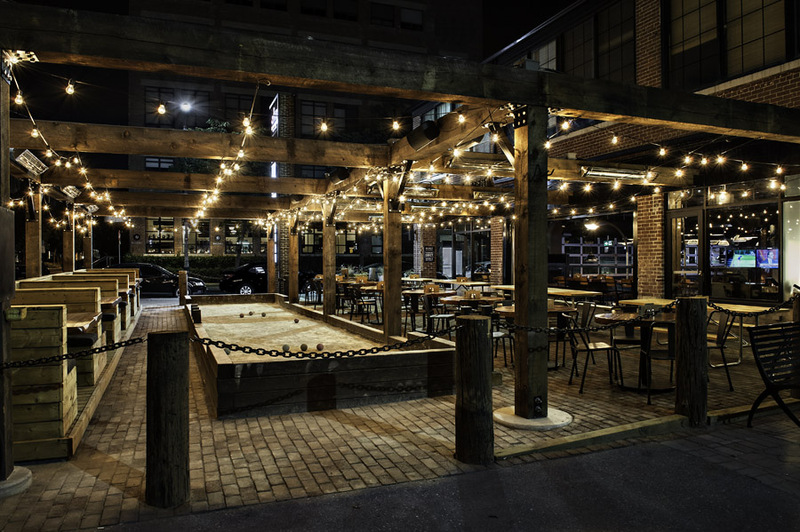 Overhead doors open to a wood trellis covered patio with an indoor/outdoor bar, seating, table tennis and bocce court. Occupying a former Imperial Bank of Canada (CIBC) building from 1940, Local Public Eatery Leaside consists of a two storey restaurant and a second floor roof patio with retractable roof, seating a total of 210 patrons. The exterior patio provides additional seating along with table tennis and bicycle racks. 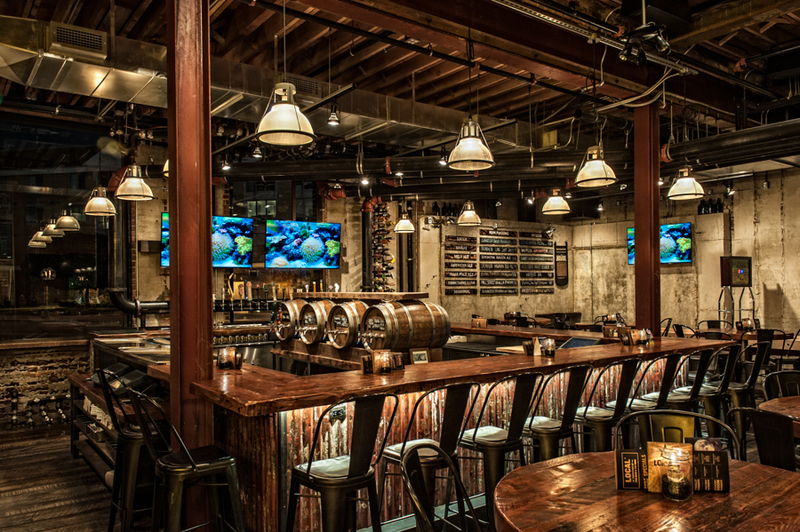 Consistent with Local’s retro-industrial design aesthetic, the interior’s exposed structure is complimented by the use of reclaimed materials and a celebration of ducts, sprinkler pipes, electrical conduits, drains and oversized beer pipes from the basement keg storage to the taps. With over 40 restaurants worldwide, Jamie’s Italian Yorkdale is Jamie Oliver’s first venture in North America. Seating 240 patrons and occupying two levels, the restaurant includes a prominent bar, a pasta-making station and an open kitchen. The interior has rustic elements of reclaimed wood, industrial metalwork and vintage chairs reflecting the rustic Italian country cuisine. The exterior is of patinated aluminum panels in a curtainwall grid with a variety of window shapes and sizes and stacking glass doors opening to patio seating at the side.